In the game, each player is given a role, of "Mobster", "Townsperson", or something else depending on which additional roles we choose. -When night begins, all players will send the moderator (that's me!) a PM, depending on your role. If you are a Mobster, you PM me who you want to kill and that night and which one of you will be doing the killing. This is done by Anokata or, in the lack of Anokata, by any of the mobsters or the one they elect to be a leader. The mobsters will also use pm the mod individually to use their special abilities (e.g. Gin's slander ability or Bourbon's investigative ability). -There will also be a dream each night. See Matsuda under Roles. -Once the mafia kills their victim (or fails to kill them), the night phase will end and the day phase begins. -When day begins, the moderator will say what happened during the night (the results of what happened after everyone's PMs have been looked at), including who died (or if nobody died). All players who had an action during the night phase will get back the results of their actions via pm. Afterwards, all remaining players vote on who to lynch under suspicion of being a mobster, and then that person is killed. Votes are sent to the moderator (they won't be counted if you just post in the thread) and all votes are posted at the end of the day phase. If there is a tie then nobody dies. Subscription Phase: Just post if you want to join. One phase is 24h long. Last edited by CTU on July 12th, 2010, 2:07 am, edited 1 time in total. - Don't ask the moderator for information about other players' roles or try to influence moderator tasks (e.g. ask them to not include players in dreams). It is frowned upon. - You may not copy/quote/screenshot etc. the PM from the GM to proof your role to someone else. But you can claim to be a role, whether it's your real role or not. - You may fake/quote/edit other players PM, just not the GM ones. There are some exceptions for dreams (see under Dreams in Keywords). - You have to PM the GM to vote/use your ability. Posting in the thread doesn't count. Everybody may vote for the lynching (BO too) and the votes will be posted in public. - In case you can't play for some days, you can make a list of actions (Day 2: vote for Akonyl Night 3: Slander Kleene etc.) If you have allies from the beginning (BO, Lover, DB's or friends) you can give them the command over your character for those few days. - You can overwrite your order. So if you voted for conia and after that send another PM to vote for Kleene Onigiri, the last give order will be used. The BO has a leader. It's Anokata. If Anokata is not in the game, another leader will be decided by the BO. The leader has the ultimate right to choose a target and will give the order. No one can overwrite the leaders order. But other members can give out an order too, if the leader didn't. But the leader can overwrite that order. So if Takagi decides to arrest Vodka for killing Heiji, Vodka decides to kill Takagi, and Takagi also decides to investigate something or other, the activities of the night will be such. Takagi will successfully arrest Vodka and will therefore not be killed and he will also get his investigations in. If Takagi does not arrest Vodka then Takagi will be killed and he will not get to investigate. In case Satou was poisoned with APTX from Gin, and Satou arrests Gin. Satou will successfully arrest Gin and not die from APTX, because arresting is the only method to hinder APTX. - Watch protection > Protect > Heal > First Aid: If a player is healed, protected and First Aided, the Protection takes effect and the target doesn't need to be healed/first aided anymore, because he wasn't injured. The protectors doesn't get healed or First Aided either. The protectors will fly out of japan or get injured. If Makoto, Ran, the protected person have the watch, the watch takes priority and the protectors didn't have to protect, thus don't have a penalty (don't fly out of japan, don't get injured). Heal and First Aid don't take effect either. The identity of the attacker won't get revealed in this single case. During the prep phase, if Sonoko chooses her friends and Yumi happens to choose the same people as Lovers, then Sonokos ability comes first. So the player that got chosen as a Best friend and Lover, will become a best friend and not a lover. - BO can kill BO if they so wish. - The mafia is allowed to and is expected to consult with each other on who to kill during the night and who to lynch during the day. You may all vote differently if you wish. - Mafia members can only kill once until all other mafia members have killed once. Then they each get a second turn to kill. - Voting: Everyone can vote during the Day Phase, whether you're a Townspeople or a Mafia member. - If Vermouth and KID are somehow in the same game and somehow choose the same person to disguise as, they will both disguise as the same role and the targeted individual will get a new role. The BO has a Leader. Every BO member can kill at night, but only if another BO member didn't kill less often. Every member can also use the APTX4869 during day phase. The leader (or highest ranked BO member) can decide to give the Black Suitcase to any member during the game. He/she can also choose a replacement for the Suitcase in case the target is killed during the day. The following roles are sorted according to their rank in descending order. - Can use one of his night actions and a Black Suitcase action. - Interrogation: "not BO", if not disguised: "BO"
- Can use either Investigate 5 or Interrogate. Not both in one Night. - Starts the game outside of Japan. Needs to fly to Japan first to be able to use actions. - Can either Travel or use Interrogate during night. Can either Travel or Vote during day. - When drunk, he'll get random results with Interrogate. - Will sober up if Eri, Ran, Conan or Shinichi dies. In case there is no Eri, Ran, Conan or Shinichi in the game, then he'll start the game with being Sober. A disguised Ran etc. doesn't count. - Can either Travel or use Protect during night. Can either Travel or vote and Protect during day. - Can lend both Gadgets to one person or different persons. - If any member of the police force learned his identity, they would instantly arrest him. Therefore 1412 may not tell his identity to anyone. But he might act as if he were an FBI agent etc. - Can use either Detect or First Aid during night. Not both. - They use Identify all together. So they can just identify one role of a player, not number of DB's. - They all can vote separately. Every DB has a right to vote and they don't need to vote for the same person. - The GM will give out one dream per night - one player get's the info of the dream (PM) on the next day, since he was dreaming during the night. - The dream will have 5 facts, 4 false and 1 true fact. - There can be hints or riddles in the dream too, which point to the real fact or could point towards something else or is a irritating hint (false hint). - You can't quote the dream and post it or PM it someone else. You need to describe it in your own words. - Only exception is, when you already have an ally from the beginning. So you may quote and PM your dream to your BO buddies, lover, best friend or the DB's. - There can be various hints/riddles given out by the GM. This can contain true and false hints. It can be about lovers in the game or who was the murderer etc. There can be hints in the dream or with the PMing of actions too. - The GM has the last decision. In case a will or tape is giving out too much info, then it can be changed by the GM accordingly. - The leader has the final say. He can decide which BO member will kill who (whether it's normal killing or sniping). His order has priority over all other members. - He can't command someone else to use APTX. So he also can't change the APTX target either. - If Anokata is not present in a game (or was killed) the BO will choose a Leader. They can either go for the ranking according to the role list (Anokata, Gin, Vermouth, Bourbon ...) or they vote for their own ranking. So each player PMs the GM with a ranking. - The leader ranking has nothing to do with the APTX ranking! In case there are not enough APTX, then the ranking of the listed BO roles will be used. - The player starts with the Status Drunk if at least one of the roles Eri, Ran, Conan or Shinichi are in the game. A disguised Ran etc. doesn't count. - The player get's Sober after one of the roles Eri, Ran, Conan or Shinichi dies. Not every role needs to die, one role makes him already sober. - After the player get's Sober, he can analyze his Interrogations during the day (even the one before he got sober). So he can Interrogate during the night and analyze his results during the day. He get's the correct answer with the analysis, whether the result was wrong because of being Drunk or because it was slandered. - There are at least 2 DB's in the game. - Players will be chosen to be lovers by Yumi during prep. phase. - When one lover dies, the other dies too by suicide in the same phase. No one can heal, protect or prevent the lover in any way from suicide. - A Town/town pair wins together with the town. A BO/BO pair wins together with the BO. A Town/BO pair doesn't win when the town or the BO wins. To win as a Town/BO pair they need to kill Yumi and everyone else to get a stalemate. 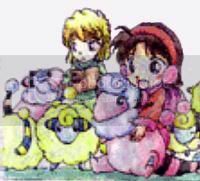 - DB's (Ayumi, Genta, Mitsuhiko) and Friends (Sonoko + Best Friend) can't be lovers. There are decisions that a player has to make during the Preparation Phase. - The player who was that role first will get a different role. He will not know that KID or Vermouth disguised as his previous role. He will not know that he got a different role either. - Vermouth will stay as a BO member. She can't become a Townspeople..
- If KID and Vermouth choose the same player, then both will disguise as that player. So KID and Vermouth can both be disguised as Ran. But there will be no true Ran inn the game. - The player will have items from his original role and from his disguised role. So he can have 2x gun in case KID or Vermouth disguises as a Police officer. - There can be all pairings that the player chose or just 1 pair or 2 pairs etc. Yumi won't know who really became lovers and who didn't. - If she befriends Vermouth, she will befriend the disguised role and will not know that it's Vermouth. Sonoko will stay as a Townspeople and will not join the BO. - If Sonoko befriends KID, she will also know the disguised role and not that it's KID disguised as someone. KID has the freedom to tell Sonoko that he's KID or not. - When Sonoko's friend dies because he/she was killed by the BO, she will learn the attacker identity. She will not learn the identity when her friend was sniped or killed with the APTX. - The player can Investigate a certain number of actions "#". He can just investigate the actions that are happening in the same night he's investigating. He can't investigate actions from past nights. - He can't investigate day actions. - He can investigate if someone is disguised. - Investigate can't be slandered in any way. - If a tricked action is investigated, then the action will be shown as "false", because the action wasn't done in the end. - Healing/First Aid, Tricking/Intimidate, Investigate/Special Investigate are considered the same actions. - Healing/first Aid and Protection are different actions and can be distinguished. - You can't tell apart a real night action from a fake night action provided by the black suitcase: You can't tell if it's a fake or real investigate/heal etc. Just use "investigate" in general here. You don't need to specify since it won't tell you the difference anyway. - He'll get the result "BO" or "not BO"
- All BO member have "BO" besides Anokata and the disguised Vermouth. If Vermouth is not disguised, then she'll have "BO"
- The player doesn't get a PM, whether his slandered target was interrogated or not. Thus he doesn't know if his slandering was effective. - The player can erase a body once (one-time use) if someone else besides him is killing the victim. If he successfully erased the victim, then he can't do this again. If the killing was hindered in any way, then he can erase again and the one-time use wasn't wasted. - The player can always choose to erase a body or not when he is killing the victim himself. It's not a one-time action and can be repeated as long as Pisco is the one killing the victim. - The identity of the erased player won't be shown. Pisco will be the only one who get's to know the identity of the erased body. - Sniping will bypass any protection (Ran, Makoto and Agasas Watch). - This doesn't bypass healing (Heal and First Aid) in any way. So a healed/first aided target will survive. - If the sniper get's tricked, nothing will happen. The target doesn't die and the protectors fly back or get injured either. - If Vermouth or KID are in the game, he will get a "true". If he asks for his/her disguise, then he'll get a false. - Can order a house search during night. This will reveal everything about the target, all actions since the start of the game, disguise and role etc. - Crimes are: Killing (normal, sniping or using APTX), disguising, slandering, tricking or intimidating, abducting, erasing, frightening, steal. Being in the BO isn't a crime. So for example, you can't blame Conia for being Gin. - This action can't be tricked/intimidated. But it can be hindered when the police officer get's killed. - May alternatively choose one player to give First Aid at night instead of Detect. - Can use First Aid on himself. - The player who received First Aid will not die immediately if attacked (by killing or sniping), but will instead be severely wounded. - A severely wounded character can not vote for lynching and can't use his day actions, and will die at the next nightfall, but has learned his attackers identity (unless it was a sniper) and may freely talk about it (and anything else, of course - until he dies). - The healed player doesn't die because of killing or sniping. Can't heal APTX or a wounded person or an injured Ran. - The attacker will also know that the target was healed/first aided, but not from whom and if there were any protectors involved. - Can bring back anyone who has been arrested with a lawsuit. There will be a message that the imprisoned player is out of prison. The identity of the one who was in prison won't get revealed to anyone tho. - The frightened player can't use his ability the next day. He also can't vote the next day. - The frightened player won't know that he got frightened. So he'll pm his day action and his voting. Then (on the next night) his vote will show as if he didn't vote. He doesn't get a notice that his voting didn't work. So in case he didn't vote and doesn't have a day action, the player won't notice that he was frightened. If he used a day action, then the GM will PM him that his actions failed. He won't get a notice if he has a day action but didn't use it. He will just notice that he got frightened after he used his day action and got a PM that it didn't work. - People that were tricked/intimidated will fail with their night action on the same night. - This doesn't affect Day actions. - The people intimidated/tricked will get a PM from the GM that their night action failed. They will just get a notice in case they used a night action. If they have a night action and didn't use it or have a day action or no active action, they won't know that they were tricked/intimidated via PM. - The Night action Arrest can't be tricked/intimidated in any way. All other night actions can be tricked/intimidated. You can also trick the interrogation/investigation that the player was able to do through the Bow-tie from Agasa. Protection from the watch can be tricked too. You can also trick the "fake investigations" that are possible through the Suit Case. - Tricking/Intimidating can prevent the BO from killing or sniping someone. - If this night action is investigated, it doesn't matter if you investigate "Akonyl tricked conia" or "Akonyl intimidated conia". Both action are counted as the same ability. So the investigator won't know of it's Vodka or Eisuke who tricked someone. - An already stolen item can't be stolen again. - The player who was robbed will get a notification on the item that he lost. But he won't know who the thief was (not if it's KID or Akemi or what player stole from him). - May choose a player to observe during the night. When the night is over the player will learn if that player is a child, female teenager, male teenager, female adult or male adult. If the target is disguised then the player will learn it for the disguise, not the true identity. - Can give one person the Protection Charm. The person with that charm will have reduced his/her lynching votes by 1 and thus could be saved from being lynched. - There will be a notice/text from the GM that the charm was in effect in case someone was saved by it. If it doesn't save the lynched one, then there will be no notice/text that the charm is in the game (even if it was given out to someone). All votes will still be shown normally. - Can't give it to herself. - Works like Agasas gadgets: Kazuha won't know the identity of the one who received the Charm. The one who got the Charm will just know that Kazuha gave it to him/her, not the identity of the player. - The whole BO get capsules with APTX4869 each game. The number of capsules is equal to 1/3 of the (starting) number of townpeople. - During each day any BO member may attempt to poison another player by sending an PM with that players name and identity to the GM. If the identity (e.g. "Shinichi") was correct that player is killed at the end of the day (after lynching). If the identity was wrong nothing happens (neither the town nor the target will not learn about the poisoning attempt). If the BO tries APTX on KID disguised as Shinichi, the BO must guess that player is KID and not Shinichi. Gin can poison pofa as Shinichi and Vermouth can poisin pofa as Ran. - The vote of the successfully poisoned target still counts (and doesn't get erased). His action also counts, thus the arresting won't be prevented. - APTX can't hinder an arrest. Even if the police dies successfully because of ATPX, the arrest still happens. - Arresting a BO member will hinder the poisoning. Nothing else can hinder the use of APTX. But in this case, the APTX wasn't used at all and won't be wasted. - Watch: He can also lend the watch to anyone for one night except for himself (it has to be returned). Someone in possession of the Watch is protected from the BO as if he were protected by Ran or Makoto, but he needs to fire from the distance so he does not get to see the attacker's face and will therefore not learn his identity. - Neither the recipient of Watch or bow-tie nor Agasa learn each others identity (so Ctu as Agasa will give the Watch to "conia", and conia alias Ran will receive it from "Agasa". - He may lend both to the same person. While he has to decide whom he'll give it to during the day, he might include (ordered) alternatives in case the one he chose gets lynched. - If Ran or Makoto get's the watch, they protect themselves and the protected target with the watch. So they don't get a penalty after that. - If the recipient of the Bow-tie has a normal interrogate or investigate due to his/her role, he can't use both that interrogate/investigate and the normal one. If Heiji get's the Bow-tie, he can just use either Interrogation or Investigation 5. Not both although he got the tie. If Ran or Makoto get the Watch, and protect a target successfully, then they will protect themselves and the protected target with the watch. So they won't get the penalty and fly out of Japan or be injured. - If Akai get's lynched, he'll kill the person he voted for too. - She may accompany anyone during the day and the accompanied will learn that Ai accompanied them. - Can just use it on one player, not number of DB's alive in the game. So even if there are all 3 DB's in the game, they can just identify one player. - If the person is disguised, they can't identify the disguise but have to identify if it's KID or Vermouth. - Can stop the lynching once per game. Doing so will not expose her role (different to what it was before APTX was introduced). The lynching must be stopped before the results are known, and if successful none will be killed by lynching during that day. And neither it will be shown who voted for whom. - During each day the leader/highest-ranked BO can decide to give the "Black Suitcase" to any player (even himself). He can also choose a substitute in case that player is killed. - During the next night the receiver can pretend to use any night-ability he/she wants. However, the player will not get a result for his/her action, it will fail all the time. - Can arrest any player at night or day. - Needs to accuse a player for a crime: "Arresting Akonyl for killing conia" or "Arresting conia for slandering pofa"
- Can't arrest someone for helping with a crime: "Akonyl helped conia in killing pofa"
- Crimes are: Killing (normal, sniping or using APTX), disguising, slandering, tricking or intimidating, abducting, erasing, frightening, steal. You can't arrest someone for being in the BO. So you can't arrest Conia for being Gin. - The police officer can't arrest for the next 2 phases if he accuses someone falsely, because he'll get suspended. 2) If there is a false arrest attempt, then there will be info that a police officer (don't know who) was suspended for the next 2 phases. There won't be any info who was supposed to be arrested either. - An arrested person may still talk freely and it's identity remains secret, but is otherwise considered dead (and can therefore not get killed, vote or use any actions). - Can decide to travel to Japan starting from Night 1. - He may also leave Japan at any time, to the same conditions as above. - While traveling, he can't use his abilities/vote or be killed/lynched. - He can't use his abilities and decide to travel in the same phase. Can just do one action. - While traveling, that player can't be killed or lynched. In case he is targeted with the APTX, he'll still die whether he's traveling or not. Hakuba decides to travel on night 1. Then he's in the plane on day 1 (can't vote and can't be killed either (by lynching in this case)) Will arrive at night 2. - May choose to protect any number of people at day. If one of the protected people is going to get lynched, he will jump in and stop the lynching. An injured Ran can't be healed and lose her injured status this way. - If tricked while protecting, the protection will fail and it's like they never protected the person. So they don't fly away or get injured. They also don't learn the attackers identity. - Doesn't learn the identity of a Sniper if the target was sniped. Last edited by CTU on July 3rd, 2010, 2:47 pm, edited 1 time in total. The sun just set in this quiet little town as everybody went in to avoid the coming storm, but they will soon relies a little rain should be the least of their fears, as several people in black walk into the town with plans to remove the "eyesore" that stands before them. News anchor: Good morning Beika. I am Hiroshi bringing you todayâ€™s top stories. Murder has struck our city as one of its youngest residents has been killed in his own house. *TV turns off as the viewer as well as everybody else headed to the part and to the gallows and the newly erected Guillotine. It was the end of the day and there was still debate about who did it and who to lynch. Although a few in the crowd decided enough is enough and grabbed a person from the crowed and brought them to the guillotine. Nobody noticed until the head of [b]Rohoph(Genta) rolled onto the floor. I met Xcommando on the street. We talked a lot and seems like I could trust him. Still, I shouldn't be too hasty and make a mistake here. I revealed some info about me but never mentioned my own name to him. I had another encounter with Akonyl. Although I talked a bit with him I didn't get to know much. He's rather silent and he seems to be scared of me too? I wonder why. We didn't share much information. Well, I told him more about my own abilities then he did about his actually. He didn't say anything about him when I think about it. On this night I also talked with TheBlind. He is a strange fellow. I exchanged some words with him. But we he didn't tell me much. I don't know his "name" either. I didn't tell him much about me too tho. There was a small encounter with a bear named Rohoph. Seemed busy and I just said hello to her. Nothing else. I got in contact with a lot more people. Schillok, xpon, Detective Tommy. None of these know my real identity tho. But They know that I can investigate and that I trust xcommando and Abs. I also contacted the one in the dream. And one of these know about my ability. TheBlind is confusing as ever. Nothing changed. Last edited by CTU on July 11th, 2010, 6:59 pm, edited 1 time in total. Last edited by CTU on July 1st, 2010, 9:37 pm, edited 1 time in total. nomemory wrote: I hope I will not die this time but if I do I demand death by giljotine or fork. Good luck my future side. Now I'm going to reread the rules. I was just thinking of removing it. Shall do so in a minute. I hope I will not die this time but if I do I demand death by giljotine or fork. Good luck my future side. Now I'm going to reread the rules. So, if Kleene updated at 11 PM, this means we reverse the time 6 hours? Not a great time for me, although I only have to go to university to sit for exams. 5 is a perfect time for me, or five to seven. But if the majority wants a diffrent time then that'll have to do. Last edited by nomemory on June 30th, 2010, 4:58 pm, edited 1 time in total. Me want to play. Seems there are newbies. IÂ´ll bet theyÂ´ll be BO. Last edited by Holmes on June 30th, 2010, 5:18 pm, edited 1 time in total. Holmes wrote: Me want to play. Can we change how healing works? Saving a townie is already strong enough. No reason to expose the mafia directly as well. So - when a player is successfully healed can we make it that the town will not learn the identity of the attacker? To compensate for the loss I suggest that a player threated by "first aid" will now be "injured" - similar to Ran. That player would not be able to use his/her abilities anymore, but can still participate in the lynch voting (and talk freely, of course). Such an injured player will not die the next day anymore. I think that would be better. We can leave the protectors the way they are now. They have certain disadvantages (getting injured/flaying away) when they protect to compensate for the advantage of learning the attackers identity and they can't protect themselves. Otherwise... looking forwards to when the game starts.